Gold, I tell you! Everything I touch turns to gold! I’ve been winning grand awards left and right! I recently won a contest at Tuesdays with Dorie, giving me a free baking cookbook (and a seat among the hallowed TWD blogroll). TWD is a baking event. Every week, a recipe is picked from the pages of Baking: From My Home To Yours by Dorie Greenspan. Then, every blogger and their mother bakes their own version of that recipe. I’ve not done a particularly good job of baking in the past. Most of my baking is f’aking, and then there’s some that just kind of falls apart (Chocolate Cherry Dr. Pepper Cupcakes, Amazing Black Bean Brownies). Until I receive the book in the mail and get to babble endlessly about my failures as a baker and as a human being, here’s a mega-update about my adventures in chocolatey things. I’m a…hungry girl? That can’t be right! In my neverending quest to eat delicious treats that somehow don’t bust my gutline, I stumbled across a newsletter called Hungry Girl. Is it run by a hungry girl? Is it a site for hungry girls? Either way, I’m emasculated by e-mail messages five days a week. Now that we can put aside all of that macho posturing, I’ll inform you that Hungry Girl is the real shizz. I’ve been perusing years and years worth of bizarre recipes and bookmarking almost every page. The recipes are fast and easy; frequently they are made with junk you have laying around. 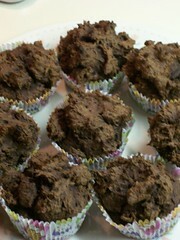 My first completed recipe was Yum Yum Brownie Muffins (click that link for the recipe). It’s pretty simple–a box of dry cake mix and a can of 100% pumpkin. I used Pillsbury Reduced-Sugar Devil’s Food Cake Mix, which is sweetened with a mix of sugar and Splenda. In the end, the muffins were each 153 calories. That, my friends, is a drop in the bucket. The muffin bucket. The muffins were dense, and fudgy. Nothing in the flavor indicated that they were “diet muffins.” They were subdued enough to eat as a breakfast treat, but substantial and chocolatey enough to frost in cupcake form. Reactions weren’t glowing, but generally positive. My mom and sister scarfed them down, and coworkers enjoyed them too. For a quick-fix recipe, that’s really all you can ask for! You may remember that I blogged about $21 of free Amano chocolate that I received. I asked for suggestions as to what I should do with the bars, and I received some interesting ones. While I considered Conor’s suggestion of intravenously feeding myself, I ended up following Joli’s advice and letting the shizzle dissolve in my mouth. It’s about as close as I’ll ever get to snooty “chocolate tasting” given my level of patience. Amano creates chocolate in three forms–Madagascar, Ocumare, and Cuyagua. All three bars have 70% cacao content. Texturally, these chocolates were heads above “similar” items from both the mass-market brands and the more widespread organic options. When it comes to flavor–eh. Some were better, some were worse. The Madagascar was revelatory. Amano says it “includes hints of citrus and berry,” and I’ll be damned if my untrained palate actually found them! This is by far the best dark chocolate I’ve ever eaten. The Ocumare was pretty good. Although the tasting notes mention “hints of plums and other red fruit,” this one tasted (to me) pretty close to a generic dark chocolate bar. Cuyagua (including “notes of spice”) was my least favorite of the three. The spice seemed to be nonexistant. The chocolate seemed somehow blander than the other products. Are any of these products worth $7 for a bar? I don’t think so. I can appreciate the amount of work and care that went into each of these bars, but when you can get a (larger) bar for $2.50 in the organic section of your supermarket it seems like an awful waste to pay triple that for similar quality. I received a free sample of Betty Crocker Warm Delight Minis: Molten Chocolate Cake. It’s the Easy Mac of cakes! 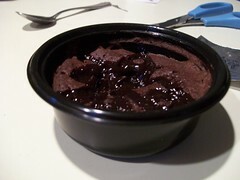 Just add water, stir, microwave, and you have fresh, steamy cake. The pack comes with a small packet of cake mix, a condom wrapper filled with fudge sauce, and a small plastic bowl. Prep was fairly easy, requiring only two minutes of work. The end result wasn’t bad. It was cake-mixy and clearly not baked from scratch, but the fact that it was fresh from the “oven” improves the little cake’s value tenfold. At 150 calories, it’s a nice (albeit expensive) calorie-cheap dessert. It has trans fats, with partially hydrogenated oils in both the cake mix and the fudge. Despite its caloric value (which is more a measure of its diminuative size and not its “healthiness”), this is not for the dieter. And…well, maybe everything I touch doesn’t turn to gold. I have a feeling there will be a lot of baked goods that turn to black before this strange, mystical journey is over. High-school classmate and American expatriate Conor Schaefer has been spending a significant amount of his time blogging about his experiences as a pizza delivery boy in Germany. Turns out that the purchasers are generous with the sympathy, but absolute stingy a-holes with their money. Here is a video blog recounting a torrential downpour that led to the world’s least satisfying delivery. Here Conor receives some mild vindication. German slice shop customers aren’t the only stingy ones.